A few weeks ago, my friend Barb and I went out antiquing for an afternoon. 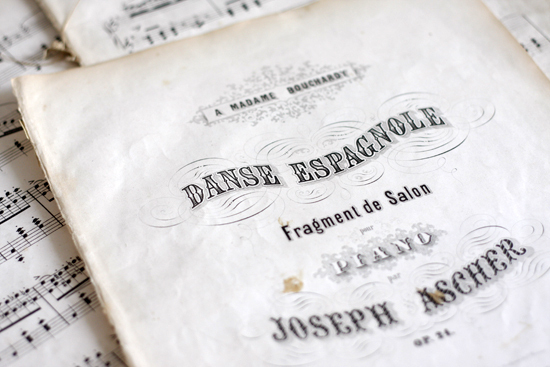 While we were in an antique mall, we found this amazing old book of German sheet music with the most beautiful title sheets. We both just fell in love and just had to have it. But what were we going to do with it? We had no idea at the time but knew that we would be hit by inspiration later. So one day over chit-chat at Barb’s house, while we were splitting up the book to each get our share of the pages, we started bouncing ideas back and forth about what we could make with this little bit of history. 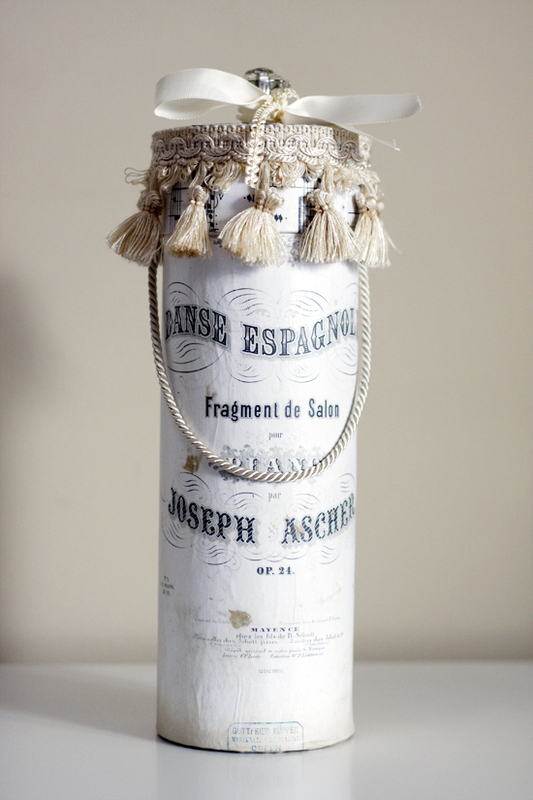 After many ideas were visualized, I settled on the idea of using the sheet music as decoration for a wine gift tube. You can buy the plain cardboard forms at Michaels for around $5 and they come with a lid that fits on top. I did not want to wreck the originals so I had color copies made of a few of the pages. This way I did not have to concern myself with screwing up the original and could make as many copies as I wanted. And besides, I was going to cover it with a coat of matte Modge Podge to adhere it to the cardboard tube. 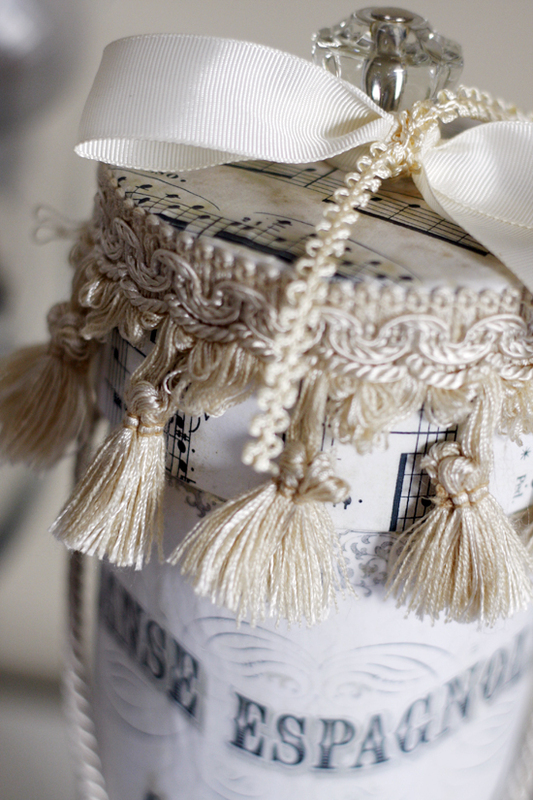 Once I glued the sheet music to the form and let it dry, I scrounged around in my scrap pile of trims and tassels and many other trinkets. I glued a glass knob to the top of the lid, added a chunky trim with tassels, and put a silk cord through the tube for a handle. After tying the ribbon around the glass knob, it was done. Just like that. It was so easy! I am thrilled as to how it turned out and I plan to make more for the holiday gift giving season. But for now, I am keeping this one part of my holiday display of decorations. And even after Christmas has come and gone, it will still look good with my home décor and I can squirrel away goodies into it!